See the way somedays you’ve got a massive hankering for a bit of cake? I find that those hankering regularly happen to me when I’m feeling lazy and sluggish. I want a bowl of warm cake but I want to make as little effort as possible. Well clafoutis is the cake for these days. For me, it’s an all year round cake. I just adjust the fruits according to the seasons. So in the summer I will make an apricot and saffron clafoutis. If I’m feeling very fancy I might make a strawberry, rosemary and seasalt one. There are no end to the combinations you could come up with. 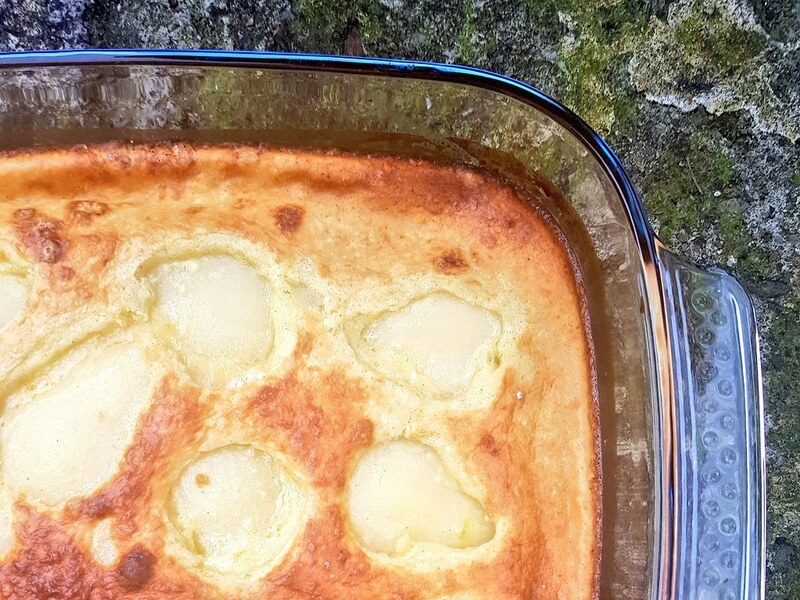 This pear and vanilla clafoutis is the ultimate dessert for the lazy boots in your life. I use tinned pears for it as I always have a tin knocking about in the back of the press. I also always have the basic ingredients for this cake in the press. If you wanted to lift this cake from mild and silky comfort pudding to something a bit more exotic, you might throw in a branche of fresh thyme in the batter. The thyme works really well with the pears. This cake takes no more than 5 min to put together and about 30 to cook. Butter the mould and sprinkle some sugar on the bottom. This will give a light caramel flavour. Place the pears in the mould (they should be half pears and the flat half should be facing down). In a bowl mix, the rest of the ingredients together until the batter is ready. Pour the batter over the pears and put in the oven. The cake will be done in 30 to 35 min. If you think it’s browning too fast reduce the heat to 180 C after 15 min. This really depends on your own oven so just make sure you keep an eye out on the cake. This cake still needs a bit of a jiggle and is best eaten straight from the mould.